Visit our horrifically unique venue at the world’s first haunt themed interactive Bed & Breakfast. 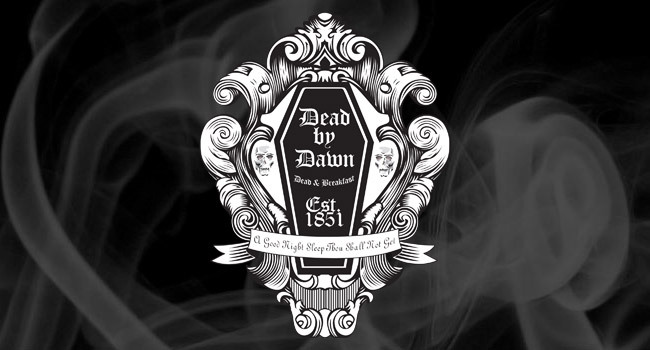 Dead by Dawn Productions is eager to accommodate your hunger for All Hallows Eve every day of the year. A good night sleep thou shall not get. Dead by Dawn Dead & Breakfast is not your typical travel destination, but you are sure to experience what nightmares are made of. Three ghastly theme rooms are available! After check-in you are invited to “Unhappy Hour” at the in house watering hole called the Shrunken Head for some unusual snacks and a beverage. You may then roam our quaint little town but must be back by 11pm, and lights out at midnight! Then the horror begins! A gourmet breakfast is served at 10:00am by the unusual host family. How was your experience at Dead by Dawn? Is this information incorrect or outdated? Let us know!